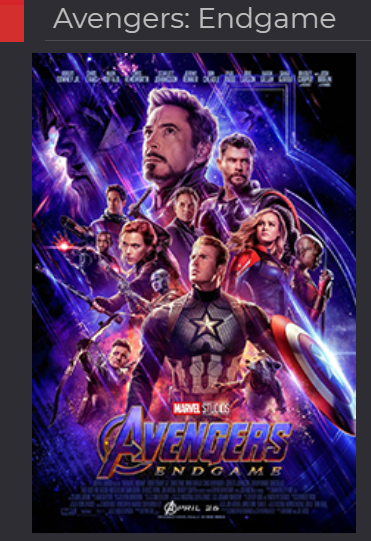 Since Avengers: Endgame is almost upon us, I thought why not look back at the previous Marvel Cinematic Universe movies using Google Data Studio. Since 2008, Marvel has released 21 films featuring their iconic superhero characters. I thought that for the first dashboard, I’d take a look at each film individually. Empire is one of my favourite movie websites, and I usually trust their reviews. So I figured it would be fun to include their reviews of Marvel films over the years. I tried something a bit different for this Data Studio report, but one that I think works well. The first step is to get some data to work with. There’s lots of useful data on Wikipedia to create table in Google Sheets. There’s lots of data here we won’t be using for this particular report. 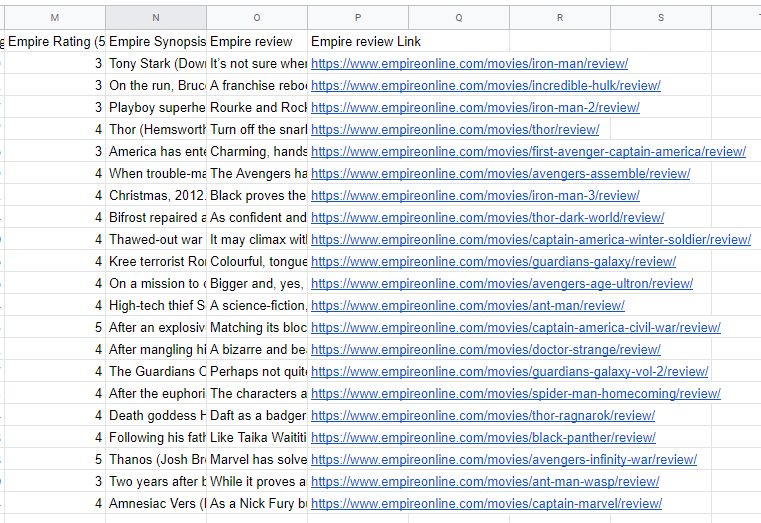 For this report though, I’ve added snippets from the Empire reviews and links to the reviews. 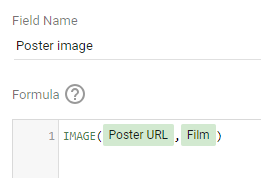 To include the movie posters, we need to make sure we have a link to the poster .jpg file. 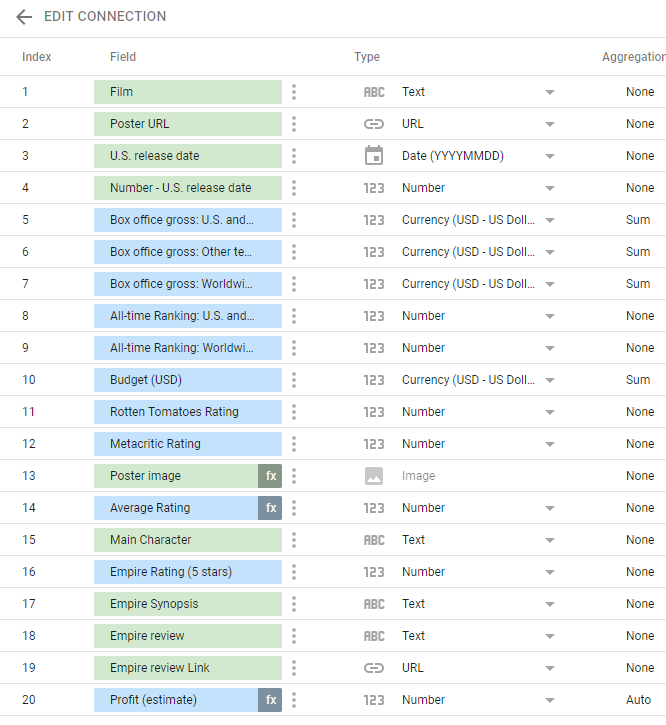 The next step is to add your Google sheet as a data source in Data Studio. There’s a lot of data here that we won’t be using for this report. You’ll also notice that there are some custom fields I’ve created. The custom field we will need for this report is the Poster image, which we create using the IMAGE function. This will let us use some nice, colourful movie posters in the report! To get the posters to display like this is fairly simple. Create a table with just the poster image as the dimension, as shown below. Then in the Style tab for the table, make sure that header, row numbers and pagination are all turned off. This should let you display the posters on their own. We can use the same “table with only one dimension” technique for other parts of the report. For example, the table that displays the title. 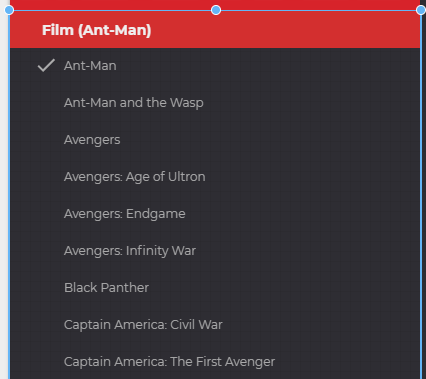 Once we’ve added the title, posters, reviews, and other bits of data as tables we need a way to filter them so that only one film is selected at any one time. To do this, add a Filter Control. 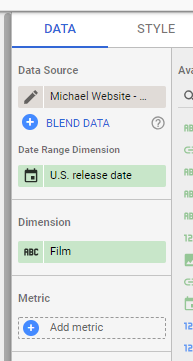 Choose the dimension as “Film” and don’t select a metric. 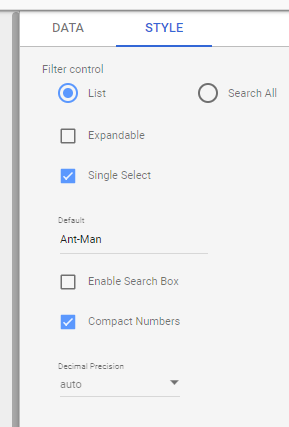 We now have a filter control that will make sure that only one film is selected, so that the title, poster, reviews and other bits of data make sense. Hope you found this useful and if you’re a Marvel fan hoped you enjoyed using the report to look at the past MCU movies! Here’s the Part 2 blog post looking at another Avengers dashboard using some new Data Studio features.